​One of our pups named Ricochet, was training to be a service dog, but showed too much interest in birds and chase drive. Because she was born into our program, we still wanted her to do something meaningful with her life. Our puppies go through balance and coordination exercises, and Ricochet showed an amazing sense of balance. In 2009, when she was 15 months old, she made an independent decision to jump on a disabled boy’s surfboard and started a revolution! She clearly showed the world what her life purpose is. 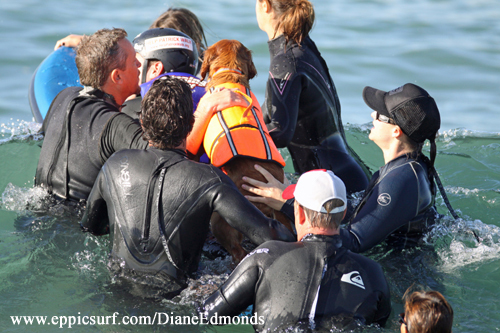 She's also the only SURFice dog® on the planet who provides therapeutic assistance while creating unique surfing experiences that empower kids with special needs, people with disabilities, wounded warriors & veterans with PTSD. In addition, Ricochet is an American Humane Association hero dog, ASPCA dog of the year, AKC Canine of Excellence and in two surf dog hall of fames. She is a certified and registered therapy dog who lives a lifestyle of helping others by 'pawing it forward' while raising awareness & almost a half million dollars for human/animal causes. ​But what makes Ricochet extraordinary is her powerful ability to make immediate, deep, heart-to-heart connections with the individuals she interacts with. She intuitively and empathically alerts to their emotional and physical changes which allows for profound paws-on healing interventions. The mission of our SURFice dog initiative is for Ricochet to achieve her highest paw'tential by serving in the role of a SURFice dog and assistive aid for people with disabilities, kids with special needs, wounded warriors and veterans with PTSD. Most of what Ricochet does isn't about surfing herself. It's about assisting people with disabilities in a non traditional way, utilizing her service dog skills and temperament. We are very proud of Ricochet, and her individual achievements. We are thrilled that we found a niche for this change of career dog, and that, although we wanted her to make a difference in the life of a person with a disability, she is making a difference in millions of lives. She is a very special dog, and if we hadn't listened to what Ricochet wanted to do with her life, and continued focusing on our expectations of her... none of this could have been achieved. We ask you to look at your own dogs, and find their strengths, find what THEY want to do... because it may just be better than what you expected! ​For more information on Ricochet's initiatives, successful fundraisers, and more, please visit her website at SurfDogRicochet.com.